The black unbalanced Canare 25' GS6TSSTS25 GS-6 Guitar/Instrument Cable is hand-assembled with an 18AWG Canare GS-6 oxygen-free copper cable, a rugged Neutrik right angle silentPLUG 1/4" TS plug, and a Black & Gold straight plug. It is suitable for use with both electric and bass guitars. Along with special polyethylene dielectric and dual shields this cable also features an extra thick and flexible 127-strand conductor, all of which let you achieve low capacitance and low series resistance. These features also help to improve the frequency response (flat to 50 kHz). A bright, ringing characteristic sound is preserved, even when using HI-Z guitar pickups with long cable runs. The double carbon/braid copper shield construction eliminates micro-phonic handling noise, especially on stage where amplifiers are often set at maximum volume levels. The Neutrik Right Angle TS silentPLUG phone connector automatically mutes (shorts) this instrument cable to avoid pops and squeals when changing the instrument under load. The integrated gold contact reed switch is activated by a spring-loaded magnetic sleeve that un-shorts the contacts only when the jack is fully mated. The switch is hermetically sealed, and is rated for at least 10,000 mating cycles. 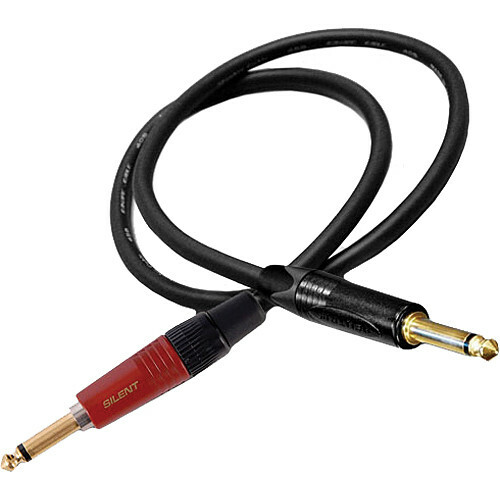 Note: Always connect the silentPLUG end of cable into the Guitar or Instrument, after connecting the other end of cable to an amplifier, to reduce the chance of amp damage or noisy feedback. For use with instrument (guitar) applications only. Damage may occur if connected to amplifier output. Center conductor (18 AWG) is composed of 127 strands of oxygen-free copper, and resists nicking and corrosion at solder joint. This robust Conductor has been specially designed to cut power loss on Hi-Z guitar pickups and all hot musical instrument signals. Good-quality frequency response results from using a special polyethylene dielectric that offers low capacitance and low series resistance. Conductive polyvinyl carbon sheath helps dissipate micro-phonic handling noise from high-gain stage amplification. This cable uses high-density braid that is tightly woven with many thin strands of Oxygen Free Copper. The GS-Series professional level instrument cable will withstand severe flexing, nightly stage workouts, and heavy-duty studio use. Tough but flexible PVC jacket resists tears and cracks. Stays pliant and will not stiffen, even at sub-zero temperatures. Capacitance between conductors to shield. Box Dimensions (LxWxH) 7.9 x 6.9 x 1.3"